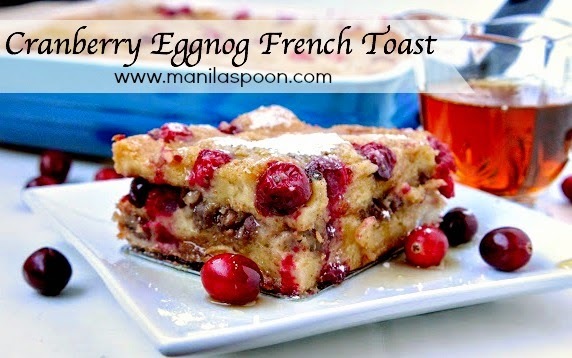 With sweet and creamy eggnog, tangy cranberries and crunchy pecans – this MAKE AHEAD Cranberry Eggnog French Toast Casserole is the perfect breakfast or brunch dish for Christmas, New Year and beyond! Oh the weather outside is frightful….let it snow, let it snow, let it snow….so goes the song. Thankfully, this year I won’t have to sing this song as I am in a warm and beautiful tropical island republic – The Philippines. This year I will have a wonderful warm Christmas, yay! Please don’t get me wrong – I do like a white Christmas, too. After all, I have lived in the US for over a decade and am used to having a cold and wintry Christmas. However, this year I am home not only to be with my family, whom I haven’t seen for 3 years, but to celebrate my parents’ 50th wedding Anniversary! So, I do have the perfect excuse to have a warm Christmas this year! I am truly delighted to be with my family for such a special occasion. Talking about special, don’t you want to wake up to a warm and sumptuous breakfast dish for Christmas or the day after? Yes, of course! 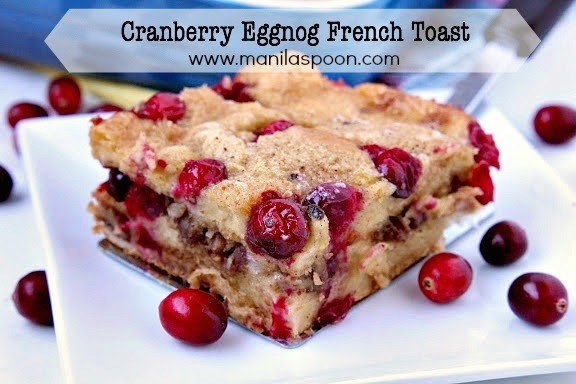 So here’s a wonderful and very tasty comfort food that the whole family will enjoy – CRANBERRY EGGNOG FRENCH TOAST CASSEROLE! What’s even more awesome? This yummy dish can be prepared the night before so the next day you can enjoy this comfort food in no time! Just bake away and have a happy breakfast! Merry Christmas everyone! Click on the print-friendly icon for printing. Click on the photos if you wish to remove them prior to printing. Butter or grease an 8 x 8 square baking dish. Place half the bread cubes in a single layer, filling in all the gaps. Evenly scatter the cubed cream cheese, 3/4 cup cranberries and all the nuts on top. Cover completely with the remaining bread cubes. Spread or insert the remaining cranberries on top (see photo). 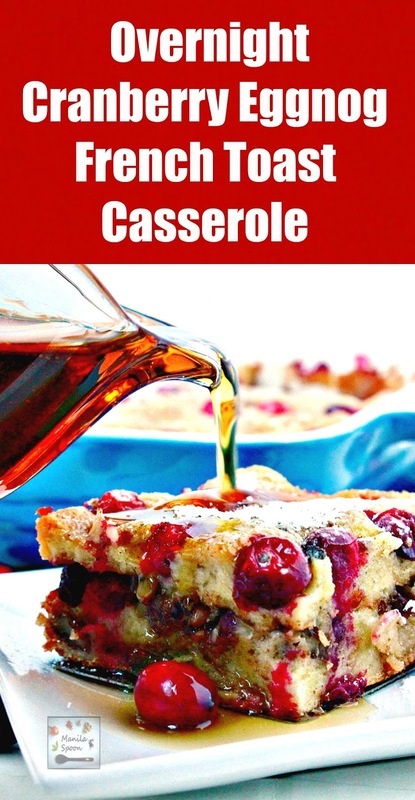 I add some cranberries on top because they make the casserole look festive and pretty! Note: You can also insert the remaining cranberries or a few extras just before you bake the casserole to make them look more prominent. In a large bowl, whisk together the eggs, eggnog, brown sugar, vanilla, cinnamon, nutmeg, and cloves. Evenly pour the egg mixture over the bread cubes. Gently press down on the cubes with your palms to allow the top layer of bread to absorb the liquid. Cover with plastic wrap and refrigerate overnight. Remove the dish from the refrigerator and let sit for 20-30 minutes at room temperature. Preheat the oven to 375°F (190°C). Bake the French toast for about 30-40 minutes or until the cubes are puffed up, nicely browned and there’s no more liquid at the bottom. Transfer the dish to a rack and drizzle the melted butter on top. Let sit for 5 minutes. Run a knife around the rim of the pan to release the French toast. Cut into squares. Serve sprinkled with powdered sugar and warmed maple syrup drizzled on top. 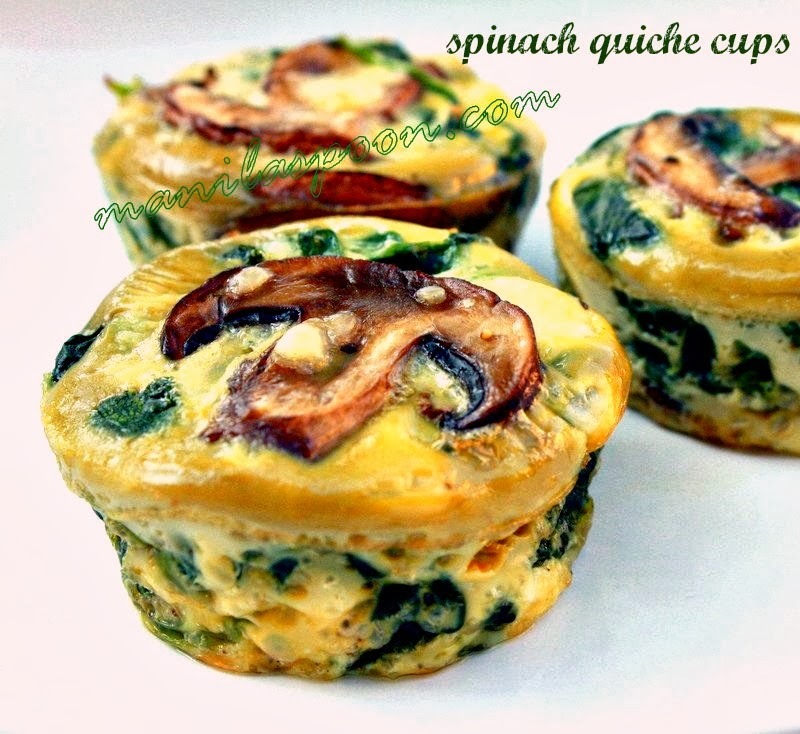 Enjoy this lavish breakfast or brunch dish! This is the ultimate French toast, looks amazing. So "indulgently" delish Abby! And what a perfect holiday brunch or breakfast dish! This looks delightful. Happy you will get to see your family for the holidays. Oh wow! It's like all the Christmas flavours rolling in to one. Love it! This looks so delicious and festive. Love that the preparations can be made ahead and then have a warm and comforting breakfast dish spending, very little time in the morning. This is perfect for Christmas! So fruity and delicious! So festive! So pretty! I need to start my Christmas morning menu, and I think this will be a big contender. This looks wonderful, i adore cranberries! I love the christmas colors in this dish! It looks so festive. Perfect for a Christmas morning breakfast! I love that it's made ahead to give Mom a break! This would be perfect for Christmas morning! I made this last year for a family Christmas Brunch and everyone declared it a favorite and a new holiday feast tradition. My family will look forward to it again this year ! I added a little coconut cream for a fun twist. The flavors are amazing … looks so festive n your holiday table… a feast for the eyes as well as the palate ! Merry Christmas !!! You just made my day Lea! Thank you so much for the feedback and we are so delighted to know you and your family loved it!!! I'm confused. Your ingredients state "1 c. fresh cranberries (divided)" but I don't see a second addition in the Procedure. That said, when I look at the final pictures it looks like your second 1/2 of cranberries are placed on top. Please help. I am sorry for the confusion. I have reworded the instructions to make it clear. Hope that helps and thanks for asking. Hope you enjoy this! Hi! I’m wondering if I could sub in dried cranberries somehow? Looks so good! You surely can! Thanks and Merry Christmas! !